It's no secret that mainstream America is embracing the green movement. Today when we hear the word “green”, it is associated less with the color itself than with the popular environmentalist philosophy. Consumers are increasingly concerned about environmental issues, and even those skeptical of all the political rhetoric will admit to a feeling of stewardship when it comes to taking care of our planet. They are making choices based on what they perceive will positively impact the earth, “reduce their carbon footprint”, save energy, and sustain instead of deplete natural resources. It is evident everywhere in our daily lives. Things like recycling, reusable shopping bags, organic food products, biodegradable waste, energy efficient appliances, hybrid vehicles, and the controversial global warming debate are all proof of the green mindset. Given that businesses today recognize the importance of being a part of the green movement, it should come as no surprise that the funeral industry has responded as well. Most of us are not part of too many funerals, and the ones we are involved in are usually pretty predictable. However, today’s aging baby boomers are slowly dismantling customary ideas about what a funeral should be. They have become accustomed to having choices when spending their money, so a big-dollar purchase like a funeral should meet their exact preferences. Mix that individuality with environmental conscientiousness, or maybe just the desire for simplicity, and you have a customer who might be enthusiastic about a “green burial”. Exactly what is a green burial? Well, essentially, it is one designed to minimize disturbance to the earth. First think about a traditional funeral. 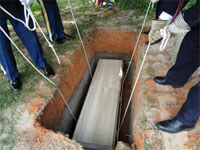 The deceased is laid to rest in a permanent container, the casket, which is lowered into a protective vault at the gravesite, and is marked by a headstone or monument. All of these things become a lasting part of the environment. The focus of a green funeral is just the opposite. Instead of the usual casket, the person is placed in a simple casket, one made of natural wood or other material that will biodegrade over time, constructed with wooden dowels instead of metal hardware. Some may prefer to forego a casket altogether, opting instead for a burial shroud made of natural fibers. Naturally, cremation is a popular option in green funerals. But to remain true to the green burial ideals, urns or other containers should be made of biodegradable materials. These days there is a wide selection of containers made of such materials as plant fibers, recycled paper, sand and gelatin. Green burials also reject the use of chemicals typically associated with the embalming process. Organic solutions are now available for use as eco-friendly alternatives. When logistically practical, burial without embalming is also possible. After all, while embalming is an established practice in our country, it is not a federal or state requirement. Cemeteries are also an important consideration with green burials, because their policies are not all the same. Those that provide space for green burials would not require a vault or a permanent marker, since the intent is to minimize disturbance to the natural environment. Some cemeteries also have areas set aside as scattering gardens for cremation ashes. Burial on one’s private land may be another option, but laws regarding burial on private property vary among cities and counties. Even though a green burial is a meaningful way to honor the departed, as well as the environment, it doesn’t mean you have to give up any of the funeral traditions that may be important to you. Green or not, visitations, viewings, and services can be planned according to individual preferences. The Green Burial Council is a non-profit organization that promotes green burials. For more information on this topic, check out their website, www.greenburialcouncil.org. Fry & Prickett Funeral Home in Carthage, Powell Funeral Home in Southern Pines, and Kennedy Funeral Home in Robbins have been certified by the Green Burial Council to provide green burials.